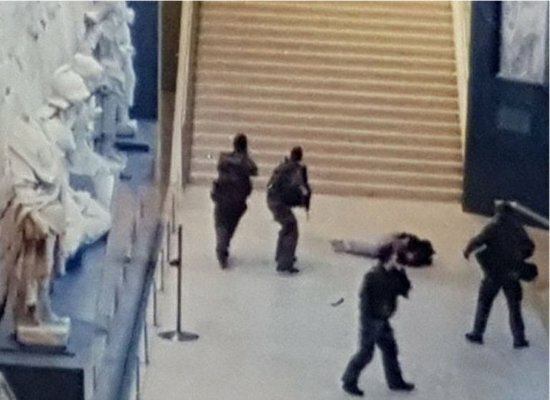 "Louvre 'attacker' was Egyptian: Machete-wielding man shot five times after attacking French soldiers outside Paris museum 'had been in the country for just over a week,'" Mail Online reported Friday. "Police source said the attacker was shouting 'Allahu Akbar' before being gunned down." All in all - assuming things remain as reported - the French are fortunate the apparent Islamist fanatic was also apparently as incompetent as he was suicidal. As the Charlie Hebdo murders demonstrated - for all the world to see (and for some from specific regions of the world to exploit) - it's just not all that hard for those with a bloodbath on their minds to acquire firepower in France. We saw that demonstrated again in Marseille . And in Roye. At least this time, the French didn't need American servicemen to save the day (yet again). Meaning had the soldiers not been at the Louvre, innocents would have died. Had the lunatic been armed with more than a machete, lots of innocents. That's because, as we see occurring everywhere citizens are disarmed, the "law" gives a distinct advantage to those who ignore it, and who then seek out those who don't. Per GunPolicy.org, an anti-gun project of the Sydney School of Public Health (but nonetheless a valuable resource in documenting citizen disarmament edicts from around the globe), "The regulation of guns in France is categorised as restrictive. "In France, the right to private gun ownership is not guaranteed by law," source-citing entries report. "In France, civilians are not allowed to possess weapons of war, certain handguns and long guns, automatic firearms, firearms disguised as other objects, and armour-piercing, incendiary and expanding ammunition ... In France, private possession of handguns (pistols and revolvers) is prohibited with only narrow exemptions.